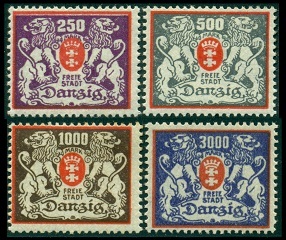 The Freistadt Danzig (Free City of Danzig) saw many provisional stamp issues during 1923, some with astounding denominations. Danzig suffered much of the same hyperinflationary spiral during middle and late 1923, as did Weimar Germany and much of the rest of Europe. 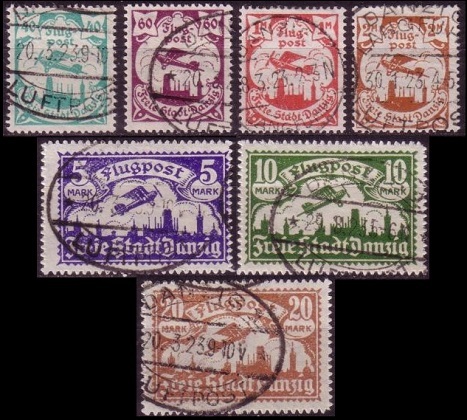 The seven airmail stamps of Danzig shown above (Mi. #112-18, Sc. #C10-13, #C15-17) were issued in early January, utilizing paper with a new webbing watermark. The Michel catalog refers to both this type of watermark and the previous "honeycomb" watermark as a "webbing watermark", with the former being "large webbing" and the later being "small webbing". Both watermarks are not that dissimilar, so this terminology may be helpful to some people, as the area within the webbing on the later watermark appears much smaller. The four new very high denomination definitive stamps shown above (Mi. #119-22, Sc. #109-12) were issued in January and February. 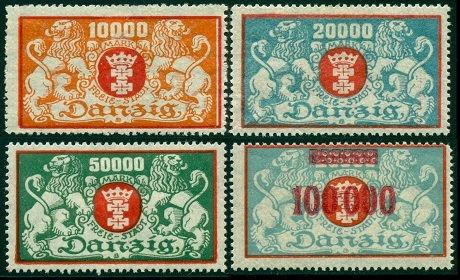 The designs are similar to that of the Coat of Arms type definitive stamps issued in 1921-1922, but these are much larger. The eight definitive postage stamps shown above (Mi. #123-30, Sc. 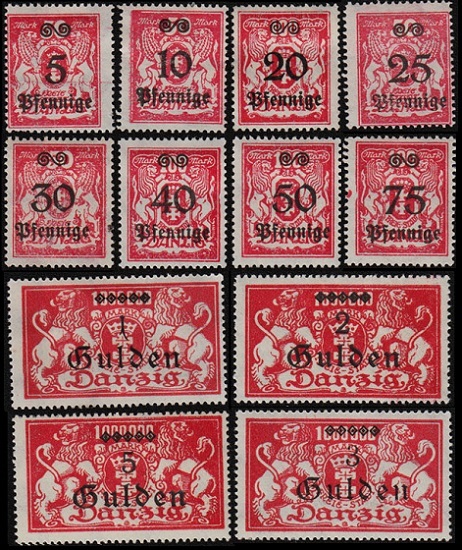 #99-03, #106-08, #118) were issued during 1923, utilizing paper with the new webbing watermark. 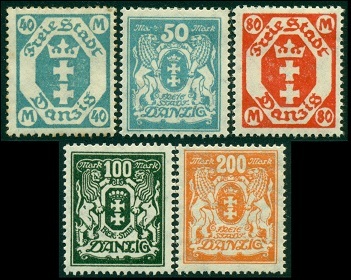 The Danzig Coat of Arms type definitives were continued, along with smaller-sized definitive stamps featuring modified vertical and horizontal Coat of Arms designs of 1921-1922. The two charity stamps shown above (Mi. #131-32, Sc. #B4-5) were issued on March 12, 1923 to provide assistance for the aged. The designs feature an elderly pensioner in front of a silhouette of the Free City of Danzig. 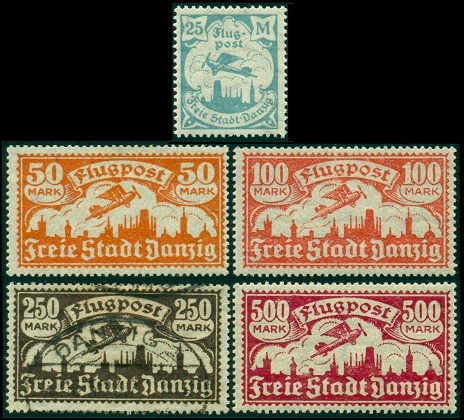 The five airmail stamps shown above (Mi. #133-37, Sc. #C14, #C18-21) were issued between February and April. The new 25 Mk. denomination is identical to the vertical type airmail stamps previously issued. The new horizontal-format high denominations, utilize the same designs as the previous issues, but they are much wider, 40 x 23 mm instead of 34 x 23 mm. These airmail stamps also utilized paper with the new webbing watermark. 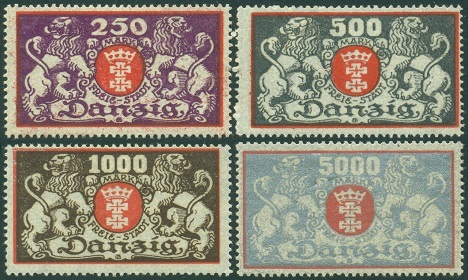 The four images shown above include all the definitive postage stamps issued between May and September of 1923. These stamps reflect the out-of-control inflationary trend of this period. They were all printed on paper with the webbing watermark. The catalog number ranges, for each of the four images shown above, are as follows. The two images shown above include all the definitive postage stamps issued between September and October of 1923. 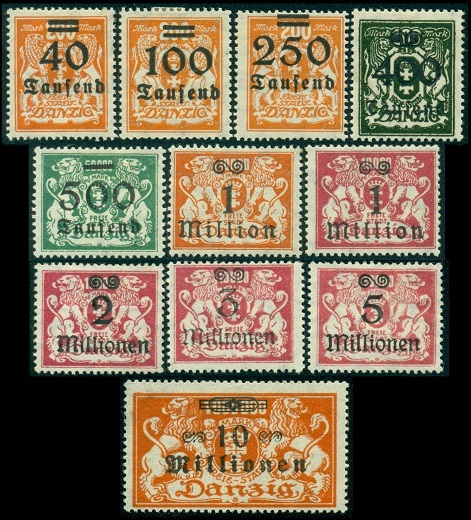 These stamps reflect the height of hyperinflation in the Freistadt Danzig. 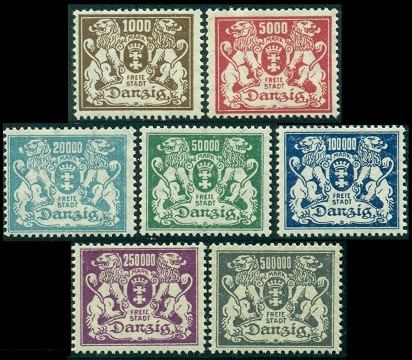 Most of these overprints and re-valuations occur on previously issued stamps of Danzig, though in many cases, the colors are different from those of the originally issued postage stamps. Most of these stamps exist imperforate, as well as with many plate and overprint varieties. None of them are unreasonably priced, and they offer a world of possibilities for the specialist. For details, please refer to the Michel Deutschland-Spezial-Katalog Volume I. The catalog number ranges, for each of the two images shown above, are as follows. The new airmail stamps shown above, at the top (Mi. #177-78, Sc. #C22-23), were issued on October 18. The new re-valued airmail stamps shown above, at the bottom (Mi. #179-80, Sc. #C24-25), were also issued on October 18. 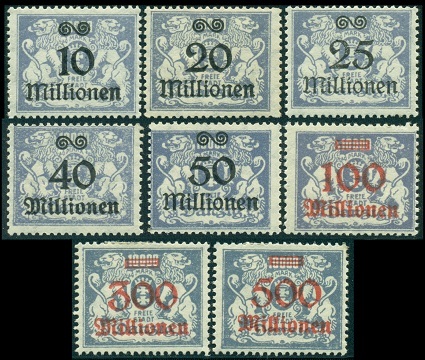 The basic stamp denominations were never issued without the surcharge, though varieties with missing surcharges are known. 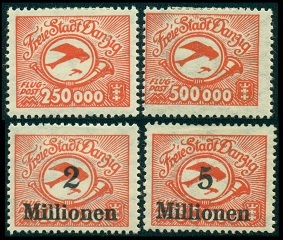 At the end of October 1923, the Freistadt Danzig implemented currency reform measures to put an end to hyperinflation. The old currency, 100 Pfennig = 1 Mark, was replaced by the new reformed currency, 100 Pfennig = 1 Danzig Gulden. 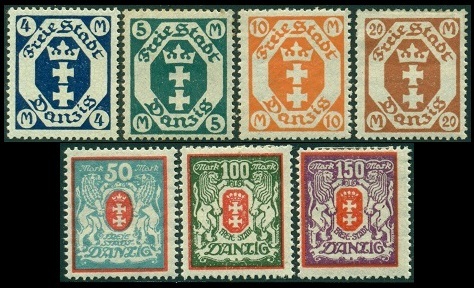 The twelve surcharged stamps shown above (Mi. #181-92, Sc. #156-67) utilized previously issued definitive postage stamp types, however, they were all printed in rose. They were all perforated 14, and they were printed on paper featuring a multiple octagon watermark.